Welcome to the AHGP Cemetery Transcription and Photo Project for Washington County, Wisconsin. If you have a cemetery listing or photos pertaining to cemeteries on the web that you would like to link, would like to transcribe a cemetery or do lookups, please email the project with the following information. 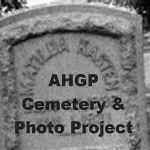 Copyright 2001 - 2007 by AHGP Cemetery Transcription and Photo Project. This nonprofit research network is affiliated with the American History and Genealogy Project (AHGP), and hosted by USGenNet, a nonprofit historical and genealogical Safe-Site Server. No claim is made to the copyrights of individual submitters, and this site complies fully with with USGenNet's Nonprofit Conditions of Use.